The Newcastle upon Tyne Trinity House is registered in England & Wales as charity no. 243369. Its primary functions are the preservation and maintenance of the historic buildings that occupy the Broad Chare site and the collections they contain. It is further committed to the continuance of ancient maritime traditions within the City of Newcastle. The Tyne Mariners Benevolent Institution: (Registered in England & Wales as charity no.229236). In the early 1800s, Master Mariners were generally not well provided for in their old age. In 1829, a number of Tyneside Masters set up a Friendly Society to provide pensions when they reached the age of 60 or were incapacitated. Soon the Society decided to build a home at North Shields for elderly Master Mariners and their wives. The 3rd Duke of Northumberland gave the land, the foundation stone was laid in 1837 and the building completed in 1840. At first called the Master Mariners Asylum, it is known now by the less intimidating name of the Mariners Homes.In 1902, the Society amalgamated with the Tyne Mariners Institute, a pension providing charity, together forming the present Tyne Mariners Benevolent Institution. Since that time, the Homes have provided accommodation in 30 flats for retired and needy seafarers and their wives. Few residents today are Master Mariners, but nearly all have been seafarers or have connections with the sea. To be considered as a potential resident, applicants must be aged 55 or over (or incapable of working), have been living in the Tyneside area for three years, be in housing need and have a minimum of five years sea service, or be the widow of such a person. An initial period of assessment will determine suitability as a resident, for the Homes have a good community spirit. To be eligible for a monthly pension, applicants must have attained the age of 55 years, or be incapable of working, have served at least five years at sea, be in financial need and have been living in the Tyneside for three years . In exceptional cases, pensions will be considered for those resident outside the immediate Tyneside area or who do not meet other necessary qualifications, provided they are deemed worthy of help from the Institution. Anyone interested in the possibility of accommodation at the Homes, or would like to discuss the possibility of pension support, should contact the Institution via Messrs Hadaway Hadaway, 58 Howard Street, North Shields NE30 1AL (Dan Renaldi or Janet Littlefield); telephone 0191- 2570382; or click here to address an e-mail via the firm’s website. Since its formation, the Master of the Newcastle upon Tyne Trinity House has occupied a permanent seat on the Board of Trustees of the Institution and the House continues to actively support this charity today. Click here to return to the top of the page. The Nautical Institute (North East Branch) Educational Foundation: (Registered in England & Wales as charity no.1042576). This charity was established in 1994 to advance nautical education through seminars in the UK and overseas, to advance nautical education in the field of nautical science for the young person, to encourage seafaring as a profession and to relieve poverty among seafarers studying to advance their knowledge in the field of nautical science, through grants and loans. Besides personal grants, the Foundation regularly makes donations to local marine organisations in the north-east, particularly those involved with the training of young people in the marine environment. The Newcastle upon Tyne Trinity House is represented on the Board of Trustees of this charity. Click here to return to the top of the page. Royal National Lifeboat Institution: (Registered in England & Wales as charity no. 209603, in Scotland as charity no. SCO37736 and in the Republic of Ireland as charity no. CHY 2678). The Royal National LIfeboat Institution is the charity that provides a 24-hour lifesaving service around the coasts of the United Kingdom and the Republic of Ireland. It provides, on call, a round the clock search and rescue service to 100 nautical miles out from the coast and a lifeguard service on 62 beaches in the South and South-West of England. The RNLI, which provides nine out of ten sea rescue launches, relies on voluntary contributions and legacies for its income. Please click here to learn more about the RNLI. There are a number of lifeboat stations in our region, but Trinity House has particular connections with the Tynemouth station, where it is represented in both management and operational areas. For more information on the Tynemouth lifeboat and the station, please click here. Click here to return to the top of the page. The Tyne Lifeboat Society: (Registered in England & Wales as charity no. 226098). Formed in Febuary 1905, this charity was historically associated with the establishment and maintenance of life-saving services on and around the river Tyne and the granting od rewards, donations and annuities to deserving persons identified with the work of life-saving or in recognition of service in furtherance of the objects of the society. In recent times, with the RNLI now running the local lifeboat units, the society has concentrated on the latter function. It supports local causes associated with the saving of life on the river Tyne and around the coastline of the immediate area, particularly supporting marine-based volunteer rescue and youth organisations on Tyneside through the administration of modest grants. For more information, please contact the Secretary Dr. C.E.C. May, 52 Shields Road, 52 Shields Road, Sunderland SR6 8JN. The Newcastle upon Tyne Trinity House is represented on the Board of Trustees of this charity. Clickhere to return to the top of the page. The Marine Society and Sea Cadets: (Registered in England & Wales as charity no. 313013 and in Scotland as charity no. SC037808). The Marine Society & Sea Cadets was established in 2004 from a merger between The Marine Society and the Sea Cadet Association and is now Britain’s largest maritime charity. Its role is to provide personal development opportunities and support in a maritime context for young people and professional seafarers from all the sea services. This is done by promoting careers at sea and highlighting the opportunities for employment that exist in the maritime sector; enhancing the well being of those at sea through the provision of a range of services; and managing the activities of the Sea Cadet Corps. Please click here to learn more about the activities of the MSSC. 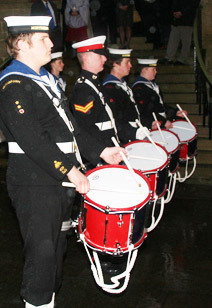 Local Sea Cadet Units participate in the Newcastle upon Tyne Trinity House Education & Training Programme and the Newcastle upon Tyne Trinity House is represented in the operation and management of local Sea Cadet units. Sea Cadets throughout our region benefit from a communal training facility at the Derwenthaugh Boat Station, near the Scotswood bridge on the river Tyne. There are currently two appeals in respect of the further development of the station: the current fleet of boats is ageing and requires progressive replacement, commencing with four older two-man dinghies. A new RIB safety boat is also needed and it is hoped to acquire a new power boat that can be adapted for disabled use. Attention thereafter will be given to a number of rowing boats. While this is an ongoing project, major capital is required up front for the development of a residential centre which will enable the Boat Station team to offer residential courses for groups of any age. This will extend the geographical catchment area of the Station and significantly increase the number of people attending courses, enhancing both training skills and personal devlopment. It will also allow specialist facilities for people with physical disabilities to be incorporated. For more information on these appeals, please contact Vic Spong on 0191-2853234. Click here to return to the top of the page. The Mission to Seafarers: (Registered in England & Wales as charity no. 212432 and in Scotland as charity no. SC039211). The Mission to Seafarers, formerly called The Missions to Seamen, is a missionary society of the Anglican Church, which cares for the spiritual and practical welfare of all seafarers regardless of nationality or faith. Through their network of chaplains, staff and volunteers in 230 ports worldwide, they reach out to them by visiting them on their ships, offering a welcome and whatever help may be needed. Centres are run in over 100 ports worldwide, where seafarers can relax away from their ships, get local information, find help with problems, share worship and telephone or email home. Please click here for more information on the work of the Mission to Seafarers. Our local Mission is located at Mill Dam, South Shields. Please click here for contact details. Click here to return to the top of the page. The Royal National Mission to Deep Sea Fishermen: (Registered in England & Wales as charity no. 232822 and in Scotland as charity no. SC039088). The Royal National Mission to Deep Sea Fishermen (the Fishermen’s Mission) provides care, compassion and support to working, retired and disabled fishermen and their families. Deep-sea fishing is dangerous and unpredictable. Hardship and tragedy are facts of everyday life in the UK’s fishing communities and it is to the Fishermen’s Mission that fishermen and their families turn when they need financial, practical and emotional support. This is the only national charity providing this care to the fishing community. Please click here for more information on the work of the RNMDSF. Our local Mission is located on the Fish Quay, North Shields. Please click here for contact details. Click here to return to the top of the page. Seafarers UK: (Registered in England & Wales as charity no. 226446 and in Scotland as charity no. SC038191). Seafarers UK is the new name for King George’s Fund for Sailors, which has been helping seafarers since 1917. It is an umbrella organisation that awards grants to other maritime charities, thus supporting present and past Royal or Merchant Navy seamen and fishermen, their families and dependents. Please click here to learn more about Seafarers UK. Click here to return to the top of the page. The Sunderland Aged Merchant Seamen’s Homes and Distressed Mariners Fund: (Registered in England & Wales as charity no. 230292) In the year 1747, an Act of Parliament was passed, entitled, “An Act for the relief and support of maimed and disabled seamen, and the widows, and children of such as shall be slain, or drowned in the Merchant Service.” One of the provisions of this Act was that every sailor above fourteen years of age was to contribute sixpence per month. The fund thus established was called “The Muster Roll Fund.” In Sunderland, the Trustees of the Port of Sunderland were appointed Trustees of the Muster Roll Fund and, in 1750, they purchased at a cost of £148 the Assembly Hall, comprising nine dwelling-houses and about an acre of land for the accommodation of aged sailors and their families. Later, in the year 1840, Trafalgar Square was built at a cost of about £3,000, thereby enabling the Trustees to accommodate one hundred and four more families. Over the years, the Homes were progressively modernised and refurbished. In the early 1950’s, the Assembly Hall was demolished and Trafalgar Square underwent major alterations. Between 1992 and 1994, the Homes were again refurbished, now accommodating 31 families in modern self contained flats. From the outside, Trafalgar Square appears much as it did in 1840 because of its Grade 2 Listed Building status. Applicants for residency must be retired seafarers of the port of Sunderland over the age of 55, their dependents, or other persons closely associated with seafaring as determined by the Trustees. A probationary 6 month period applies to new residents. Residents do not pay rent but are required to pay a nominal Weekly Maintenance Contribution. The Trustees also manage the affairs of the Distressed Mariners’ Fund which makes grants to assist shipwrecked seamen, and the widows and orphans of shipwrecked seamen, of the port of Sunderland. For more information, contact the Secretary Capt. P. Wynn, 27 Trafalgar Square, Sunderland SR1 2BW. The Newcastle upon Tyne Trinity House is represented on the Board of Trustees of this charity. Clickhere to return to the top of the page. The Tynemouth Volunteer Life Brigade: (Registered in England & Wales as charity no. 1093237). The Tynemouth Volunteer Life Brigade is a voluntary shore based coastal rescue service founded in 1864. They are a Declared Facility to HM Coastguard for Cliff Rescue, Coastal Search and Rescue and one of the last remaining trained teams for Ship to Shore Breeches Buoy Rescue. Operating from their Watch House Museum in Tynemouth, they work closely with all the emergency services. The Brigade has responded to over 100 callouts a year in recent times, ranging from monitoring and gathering information on broken down boats to recovering cliff casualties from the north-east coastline. The Watch House Museum displays artefacts, pictures and relics from old shipwrecks chronicling the history of lifesaving on the Northumberland coastline since 1864. Please click here to learn more about the Brigade and its activities. Click here to return to the top of the page. The Sunderland Volunteer Life Brigade: (Registered in England & Wales as charity no. 1105980). The Sunderland Volunteer Life Brigade, previously the Roker VLB, was formed in 1877 and has been credited with saving over 800 lives since that date, mostly by breeches buoy. That means of rescue is little used today, but the Brigade remains active as a Coastal Search and Cliff Rescue unit, on call 24/7; it promotes safety on the coast by giving talks to community groups and school children; and it actively involves itself in working with the community. A Coastwatch Station, which open 3 days a week has recently been opened and enjoys declared facility status. The ultimate aim of the SVLB is to operate seven days a week, to keep watch over the coast, reporting dangers as they occur and responding to coastal emergencies in the area. The SVLB Watch House Museum is open to the public every Sunday and the Brigade are working towards making it an accredited museum. Click here to return to the top of the page. The North East Maritime Trust: (Registered in England & Wales as charity no. 1117855). The North East Maritime Trust was formed in to generate renewed interest in traditional seagoing activities in the region through the care, maintenance, restoration and reconstruction of wooden vessels. It promotes study into the history and development of different boat types by purpose and location, the maintenance of traditional boat building techniques and demonstration of working practices. The Trust has established a riverside workshop at Wapping Street in South Shields, through which it informs the public about maritime heritage through Open Days, seminars and visits by interested organisations. It encourages Regional Development Agencies, Local Authorities, museums and the Private Sector to support maritime heritage projects, education and events, in order to boost public interest and regional tourism and collaborates with other maritime organisations – in particular in the organisation of maritime events for traditional craft. Please click here to learn more about the NEMT. The Newcastle upon Tyne Trinity House is represented on the Board of Trustees of this charity. Click here to return to the top of the page. The Friends of St. Mary’s Island: (Registered in England & Wales as charity no.1093840). St Mary’s lighthouse lies on a small island, accessed by a causeway, to the north of the entrance to the river Tyne at the north end of Whitley Bay. In 1984, the lighthouse was decommissioned and, in response to popular support within the borough of North Tyneside, an appeal was launched to buy the property and thereby maintain access for the the people of the North East coast and their visitors who had loved its lighthouse and enjoyed its wildlife for generations. The many local people who had worked voluntarily to achieve this result founded the Friends of St. Mary’s Island in 1990, and it was reformed in 1996. Its members are engaged in a number of activities, including fund-raising, which contribute to safeguarding the future of the lighthouse and its nature reserve. In 2002, the Friends were successful in obtaining Charitable Status and a new constitution was accepted by the members, so that the objects and aims of the group were more focussed in outlook. For more information on the activities of the Friends of St. Mary’s Island and on the history of the lighthouse and the island, please click here. The Newcastle upon Tyne Trinity House is represented on the Board of Trustees of this charity. Click here to return to the top of the page. Please note that the Newcastle upon Tyne Trinity House is not responsible for the content or operation of external websites accessed through this site.